Layers of moist chocolate cake studded with peanut butter chips, light and fluffy peanut butter mousse, and crushed peanut butter Oreos! Definitely no shortage of peanut butter here! Peanut butter is very high in fat, and calories. 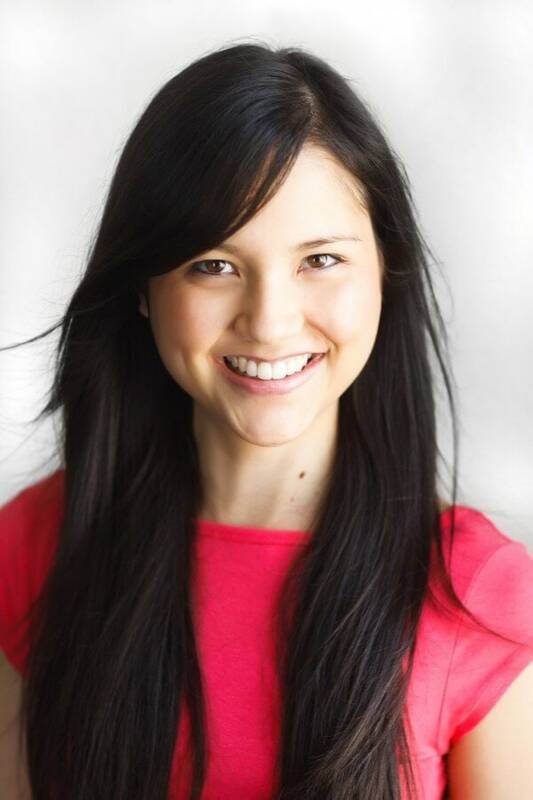 But the good news is, you get a lot of nutrition for your 190-calorie investment. Nuts and nut butters are a great source of protein, fiber, vitamins, minerals, and phytochemicals. Today, I’ll be sharing a recipe that’ll make all you fellow peanut butter lovers swoon! 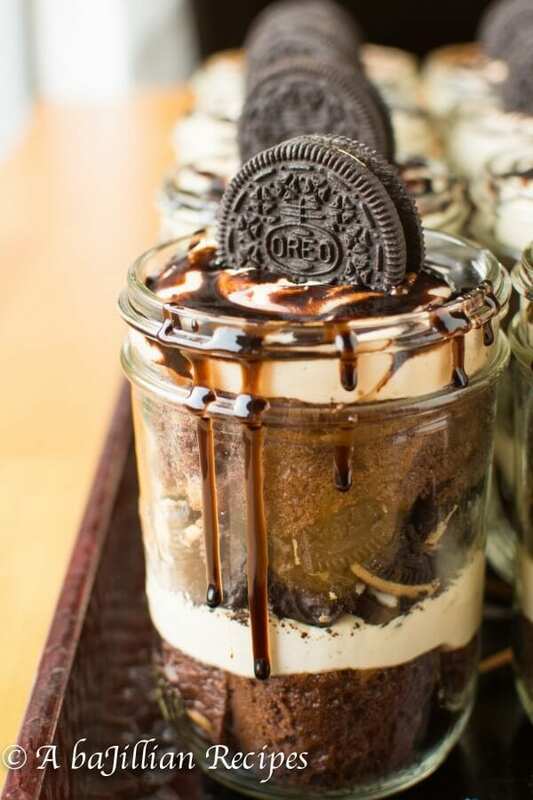 These Mini Peanut Butter Oreo Trifles have everything that a peanut butter addict could ask for. I’ve always been obsessed with little miniaturized desserts, and trifles are no exception. 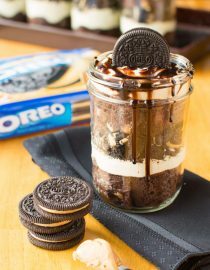 So when I made my Mini Funfetti Oreo Trifles a few months back, I just knew that mini trifles were the only way to go. Not only do they make the perfect homemade gift for literally any occasion, but they’re super portable, and they freeze really well. So if you’re feeling a little greedy, which is likely to be the case after one bite, you could easily freeze all eight of these trifle minis and enjoy one a week (or one a day!) without anyone else knowing. Genius! 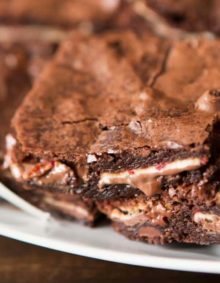 Hey, sometimes it’s ok to be a little greedy, ESPECIALLY when it involves desserts! I only say this because I’ve done the exact same thing. Don’t judge me.. These “little” jars are also perfect for portion control. 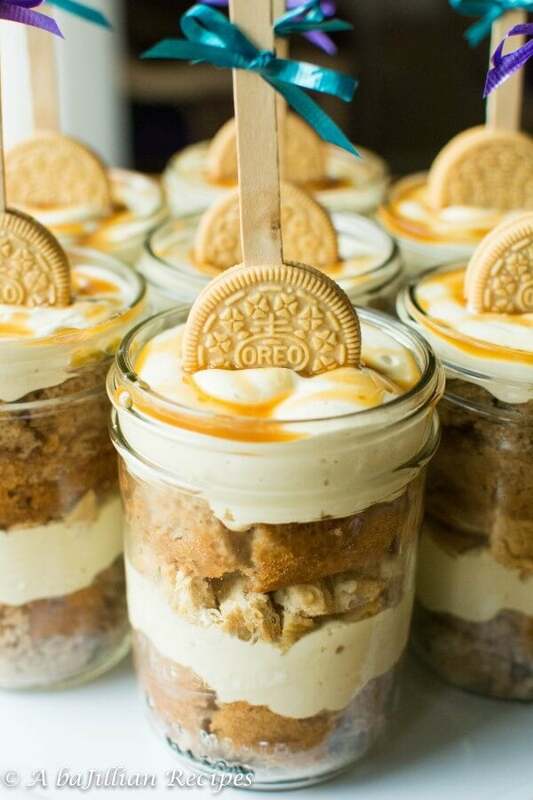 Though some might argue that the jars are a tad bit on the larger side (at least they’re not quart-sized), those same individuals are likely to recant that statement once the first spoonful of peanut buttery Oreo goodness passes their lips. Is Peanut Butter Safe for Dogs? Most peanut butter is safe for dogs – which makes it a great treat for pups. Will Trifle Get Soggy if Kept Overnight? Trifle is always best prepared the day you will be serving it. Leftover trifle can be stored, loosely covered in the fridge, for up to 3 days, after which it will still be edible but the cake will be very soggy and the pudding will become looser, soaking up the whipped cream and syrup. Spray a 9×13-inch baking dish with nonstick cooking spray. 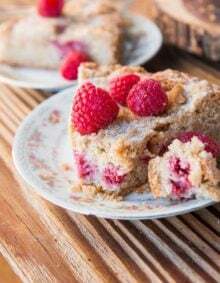 In a large mixing bowl, combine the cake mix, hot water, melted butter, and eggs until fully incorporated. Stir in peanut butter chips, then pour batter into prepared pan. Bake for 33-35 minutes, or until a toothpick inserted in the center comes out with few crumbs attached. 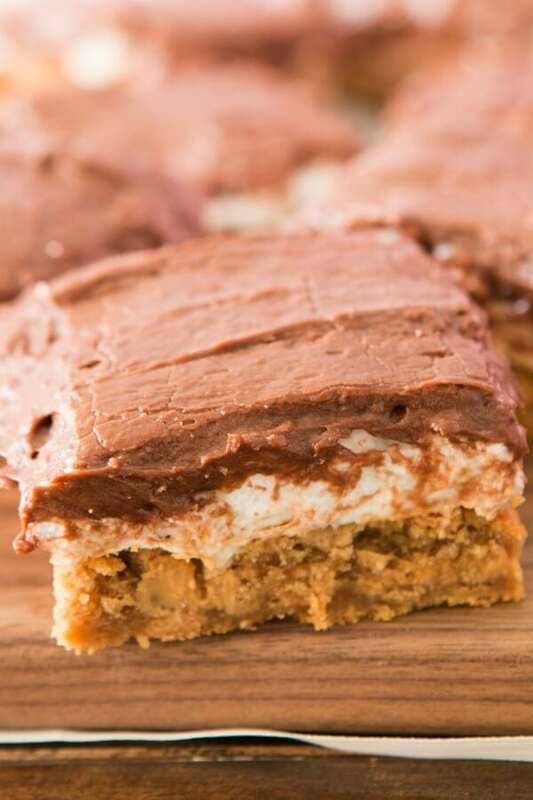 Allow cake to cool completely, then slice into bite-sized cubes. Melt the peanut butter chips in the microwave until smooth; set aside. 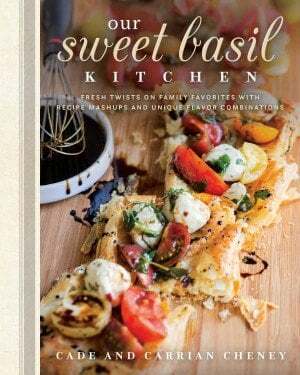 In the well-chilled bowl of a stand mixer fitted with a whisk attachment, beat the heavy cream until soft peaks form. Add powdered sugar and vanilla. Continue whipping until stiff peaks form. Transfer whipped cream to another bowl and refrigerate until ready to use. Switch whisk attachment out and replace with paddle attachment. Mix in melted peanut butter chips. Add peanut butter and continue mixing on high for 2 minutes until mixture is smooth and thickened, scraping down the sides of the bowl as needed. Add 1/3 of the whipped cream to the bowl and mix thoroughly. 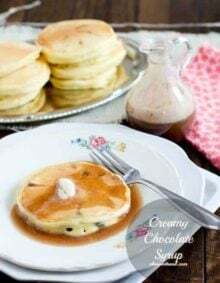 Remove bowl from mixer and use a rubber spatula to gently fold the rest of the whipped cream into the mixture. Transfer filling to a pastry bag or a gallon-sized ziploc bag with the tip of the corner cut off. 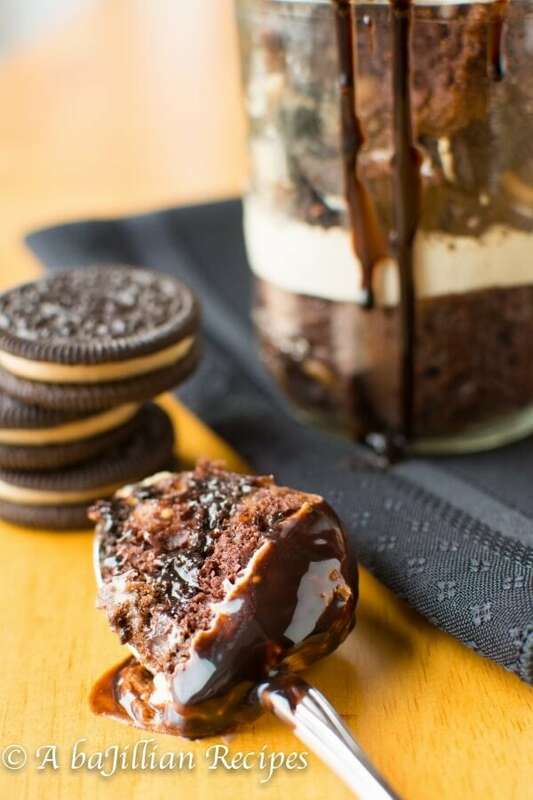 Place a layer of cake cubes in the bottom of each jar. You’ll use half of the cake. Then pipe half of the filling into each jar. 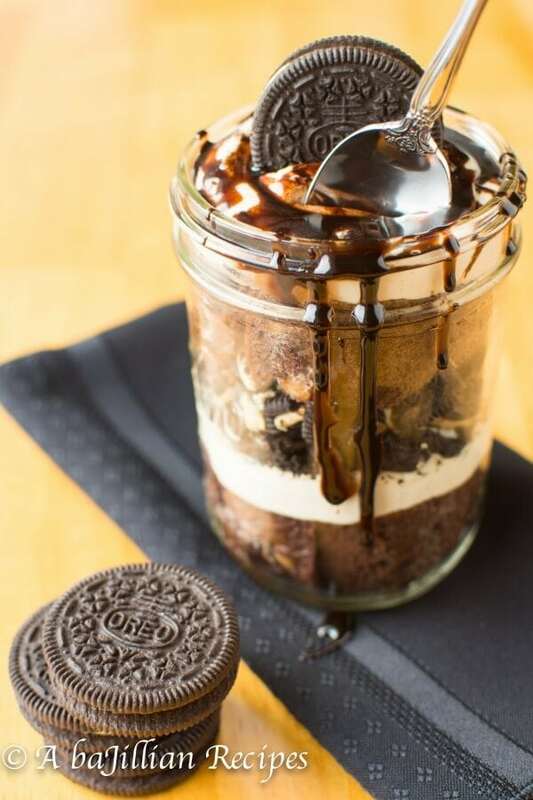 Reserve eight of the Oreos (for topping the trifles), then coarsely chop up the rest; sprinkle evenly among the jars. Add another layer of cake cubes (you might end up with some leftover), followed by the rest of the filling. 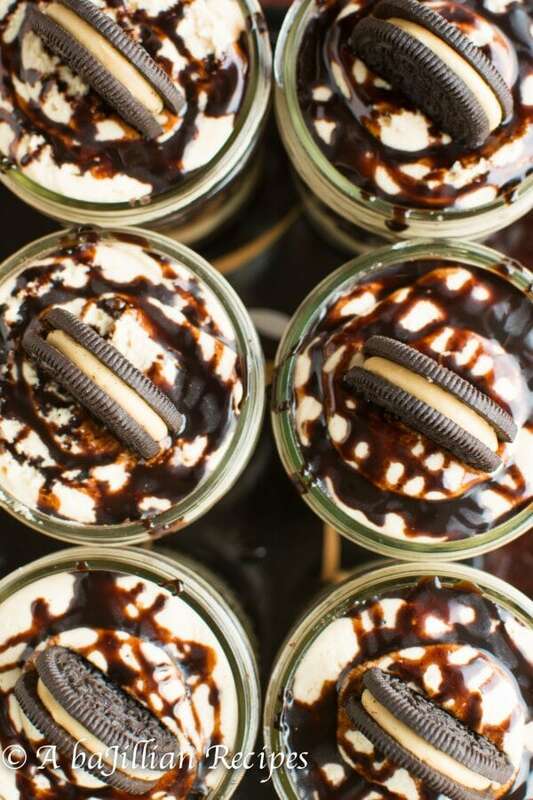 Garnish each jar with a drizzle of chocolate syrup and one more Oreo. 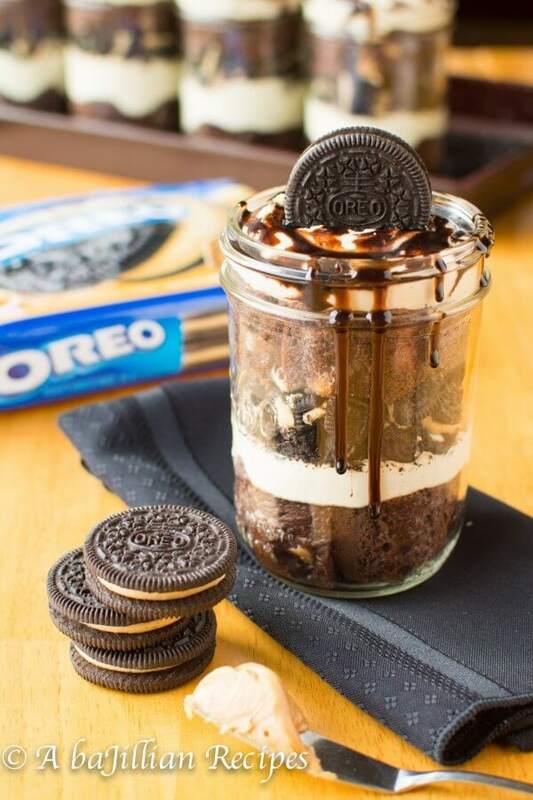 You’ll need 8 pint-sized mason jars. I served these last night for a dinner party. 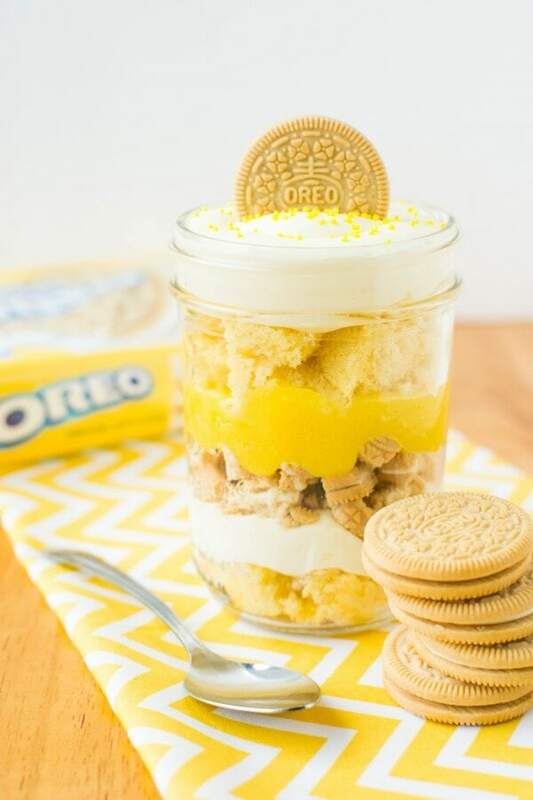 These went over big time…The trifles were not overly sweet, and really fun to eat from the mason jars. These were anything but “mini” 🙂 A really nice sized portion, and definitely on my dinner party rotation. 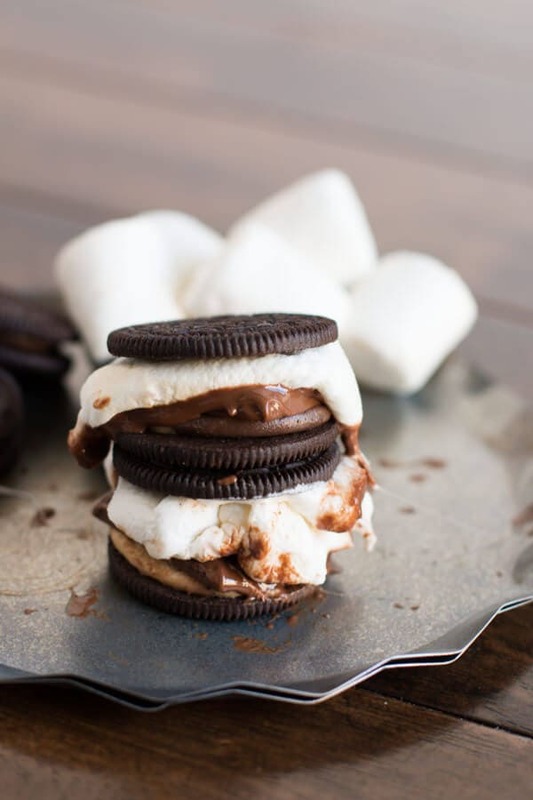 YES-pb & Oreo’s are the tastiest combo! These trifles look and sound incredible, esp that pb mousse! Thanks Kayle! The peanut butter mousse is definitely my favorite part of these trifles. It’s like a light peanut butter cheesecake mousse!